Because I made Thanksgiving pizza, I thought it was only fitting to follow that up with some Thanksgiving ice cream. 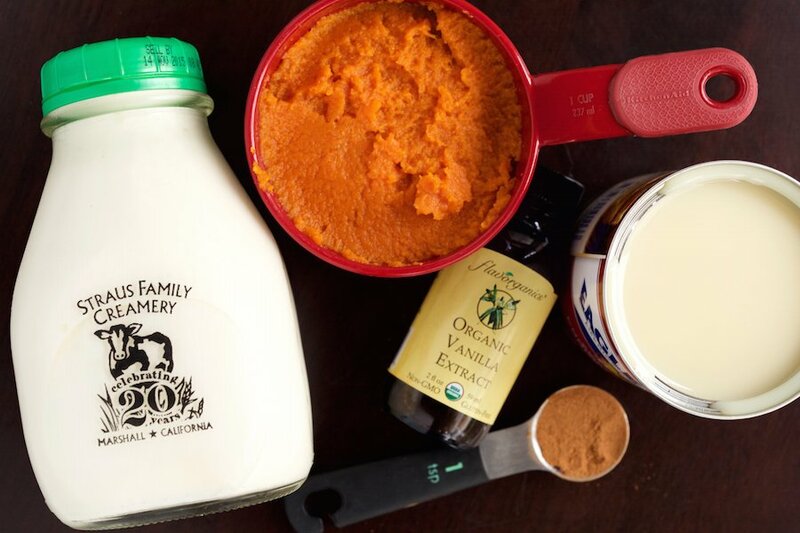 Pumpkin Pie Ice Cream is nothing new, there are dozens of recipes for it across the internet. However, when I was researching, I didn’t feel like anybody was really taking it to the next level. No problem, I’ll take it from here! I considered doing a milkshake, but I then thought I needed something even more decadent (you know, because it’s the holidays). 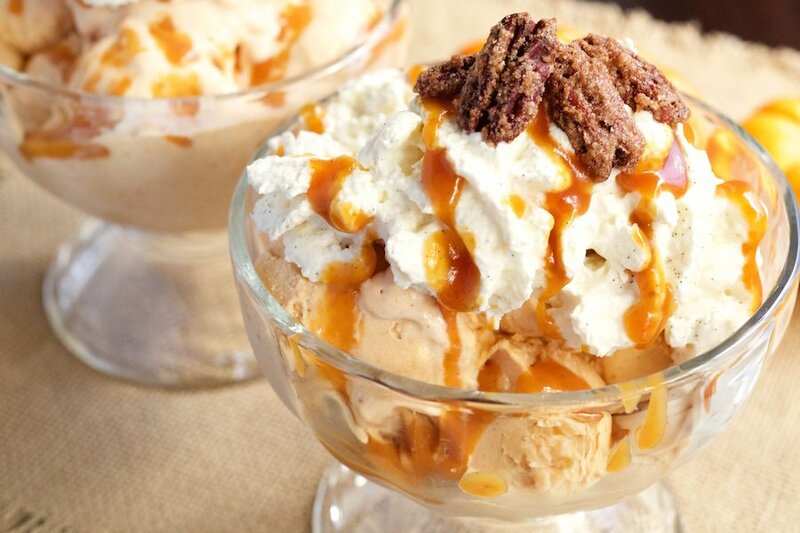 I wanted something I could layer with multiple different recipes…Pumpkin Pie Ice Cream Sundae it is! I tried to incorporate all the classic ice cream sundae toppings. Here’s what I came up with: warm Pumpkin Caramel sauce, light and fluffy Maple Vanilla Bourbon Whipped Cream, and classic Candied Pecans. Mmmm….it really is the holiday embodied in a sundae. I have included instructions to make the pumpkin pie ice cream in an ice cream maker or without one. 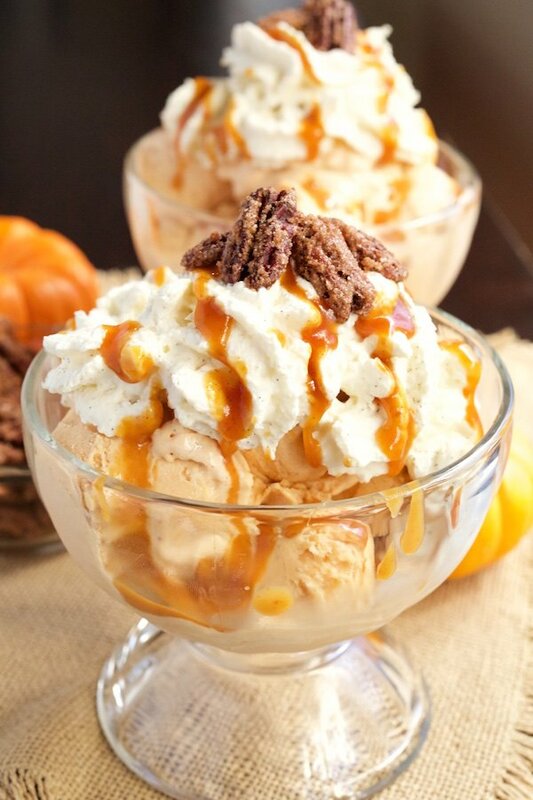 I hope you enjoy my Pumpkin Pie Ice Cream Sundae recipe and have a wonderful Thanksgiving! Put all ingredients in a bowl and whisk together. When combined, pour into ice cream maker (I use this one) and churn according to manufacturers instructions. You will probably want to pour it into your mold (a bread pan works great) and freeze for several additional hours until it is set. Put the cream in a chilled bowl and whip until stiff peak forms. Slowly stir in the condensed milk, then add the pumpkin pie spice mix and vanilla. Pour into a container (a bread pan works great) and freeze for several additional hours until it is set. The recipe I used is from Crazy For Crust. Caramel is a little tricky to make and she gave very clear instructions, so I am going to send you directly to her recipe for instructions. Add cream, bourbon, and maple syrup to a metal bowl that has been chilling in the refrigerator. Split the vanilla bean and scrape insides into bowl. Whip until soft peaks form. You can use this as is on top of the Ice cream sundae, or put it in a whipped cream dispenser like I did. These use nitrous to give the whipped cream a little more “oomph” and texture. Preheat oven to 225. In a large bowl, beat the egg whites and water until foamy. Add pecans and stir to coat. In a separate bowl, whisk together the sugar, salt and cinnamon, then pour over the pecans, stirring to coat. Spread pecans on a baking sheet that has been sprayed with cooking spray and bake for one hour, stirring every 15 minutes. Put a couple generous scoops (you deserve it!) in a bowl. Add the whipped cream, drizzle a little warm pumpkin caramel, and top with candied pecans. BAM! Pumpkin pie ice cream sundae ready to be devoured.